Francine's Friends: Francine's Friends Partners with Taylor Rental - Pink Port-a-johns! Francine's Friends Partners with Taylor Rental - Pink Port-a-johns! "thinking pink" this spring, summer and fall - Pink Port-a-Johns! Taylor Rental Plus of Auburn, Indiana is introducing pink port-a-johns! These "pretty in pink" portable restrooms are perfectly designed for women - no urinals, purse hooks, and a pretty pink interior and exterior. Plus, 15% of the rental cost is donated to Francine's Friends! "The battle against breast cancer is something we strongly want to help support," explained Natalie Taylor, Store Manager. 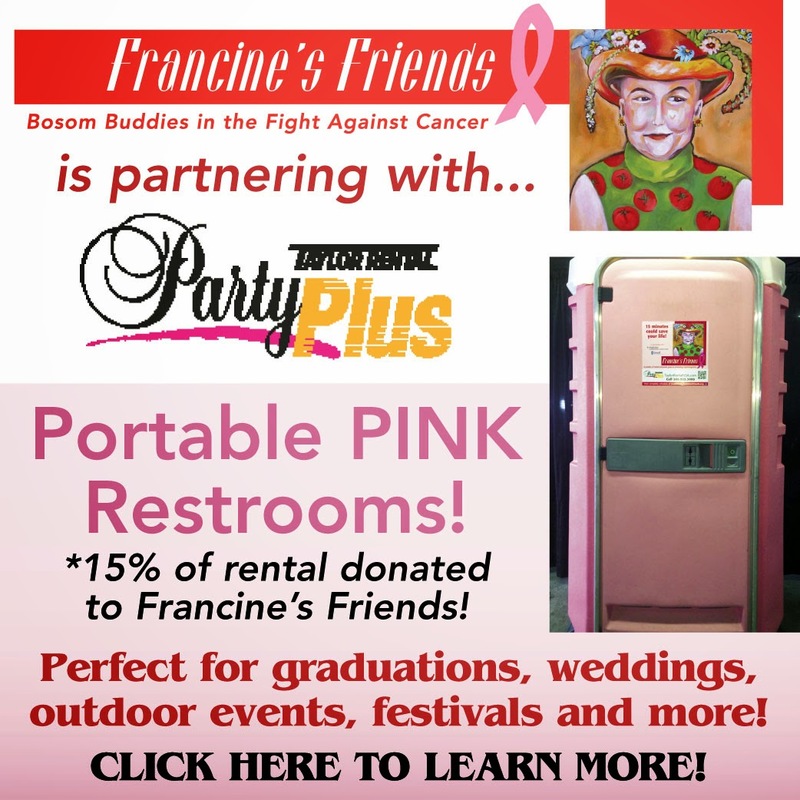 "We loved the idea of collaborating with Francine's Friends - and want to see a fleet of pink portable restrooms at all types of events this season - weddings, graduations, outdoor parties, festivals and fundraisers - everywhere! We love how they look!" said Taylor. Please help us spread the word that these special portable restrooms are available - great for upcoming graduation parties, weddings, any party or outdoor event! For more information on renting the pink port-a-johns, click here. You can also download the PDF below, call 260-925-3000 or email Natalie at party@taylorrentalusa.com.